My friend, Keith Kopp is a great clarinet player and piano tuner. He is responsible for more than one hundred pianos in the School of Music at Brigham Young University. We got talking about what I do for a living one day and he started wondering if I could answer a question he had about piano wires. It turns out that Keith is using wires from two different manufacturers and found that one wire was breaking more frequently than the other. 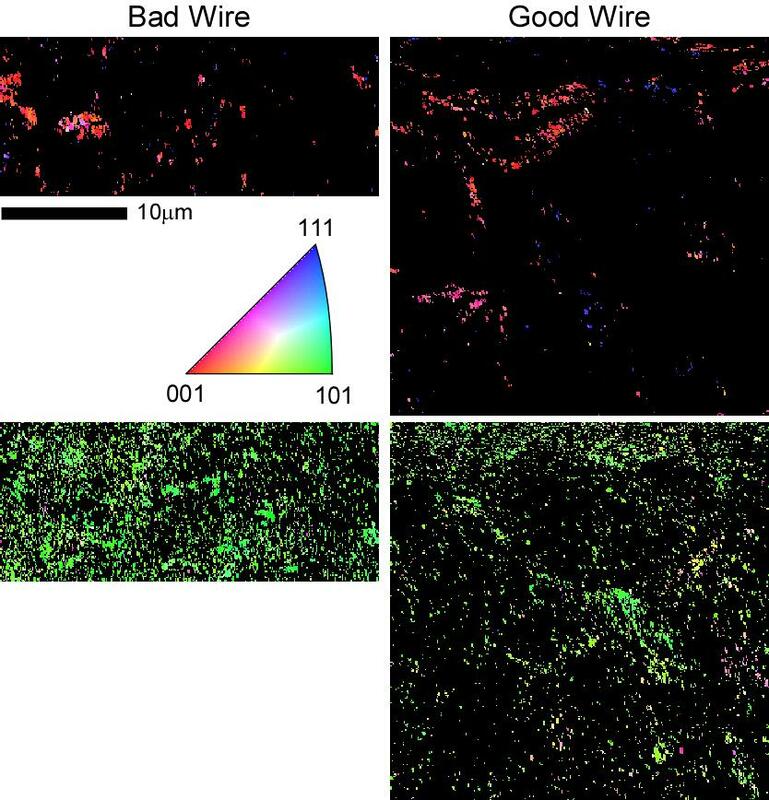 It made me curious as well so I offered to take a look at the microstructure of the two wires. The first thing I did was get on Wikipedia to try and learn a little bit about piano wires. It turns out that piano wire is made from tempered high-carbon steel. Remarkably, the oldest recorded use of wire for musical instruments is 1351 in Augsburg. Today’s wires are high tensile polished wires made by cold drawing. Ron Witt of EBSD analytical was kind enough to prepare cross-sections of the wire for EBSD and ran a couple of OIM scans from two different wires that Keith gave me: 1) a “good” wire and (2) a “bad” wire – the good being the wire that is less prone to breakage. The first thing we noticed was the small grain size of the wires. The first few scans drifted quite a bit most likely from hydrocarbon contamination due to the small step size used to characterize the fine microstructures. We elected to run the OIM scans with 30nm step sizes. With a little effort, Ron was able to get me a couple of good scans with only minimal drift. The other thing we discovered is that the two wires contained both a face-centered cubic (FCC) phase and a body-centered cubic phase (BCC) which we presumed were austenite and ferrite. It is possible that the bcc phase was actually martensite which is body-centered tetragonal (BCT) but difficult to distinguish from the BCC phase as it generally exhibits only a few percent of tetragonality. Phase maps of the two wires are shown below with the bad wire on the left and the good wire on the right. The phase fraction for the good wire is BCC/FCC = 21.4/78.6 and 13.4/86.6 for the bad wire. While these scans represent relatively small snap shots of the full microstructure of the wire, the results were consistent across the other scans we collected not shown here. Because of the difficulties in obtaining good data from the materials with such small grain sizes, I have elected to filter out the suspect data. This was done by first running a grain CI standardization clean-up on both sets of data. The grain parameters used were 5° for the grain tolerance angle, 2 pixels for the minimum grain size but with the requirement that the grain must extend across at least two rows of the OIM scan. Then I filtered out data with CIs less than 0.1 and grains with equivalent grain diameters less than 50nm. In the case of the good wire the filtered data contained only 11% of the original scan data and 27% in the bad wire case. The larger fraction of high quality data from the bad wire appears to be attributable to a larger grain size. The textures between the two wires also differ. The following IPF maps (showing the crystal direction aligned with the longitudinal axis of the wire) show some interesting features. First, the BCC phase tends to be dominated by  crystal axes parallel to the longitudinal axis (colored green) whereas the FCC phase tends to have  axes parallel to the longitudinal axis of the wire (red) with some  (blue). For Keith’s benefit (and piano technicians everywhere) the phrasing above is not as complicated as it sounds. A metal wire is made up of many small crystallites. These constituent crystallites all have an orientation associated with them with respect to the principle axes of the wire. The distribution of these crystallite orientations we term crystallographic texture. The following schematic shows how the crystallites (in general) are oriented within the wire. In this schematic, the crystals shown can actually be rotated about the horizontal axis in the figure to any other orientation. When the crystallites have one axis aligned with a particular axis of the sample it is called a fiber texture. 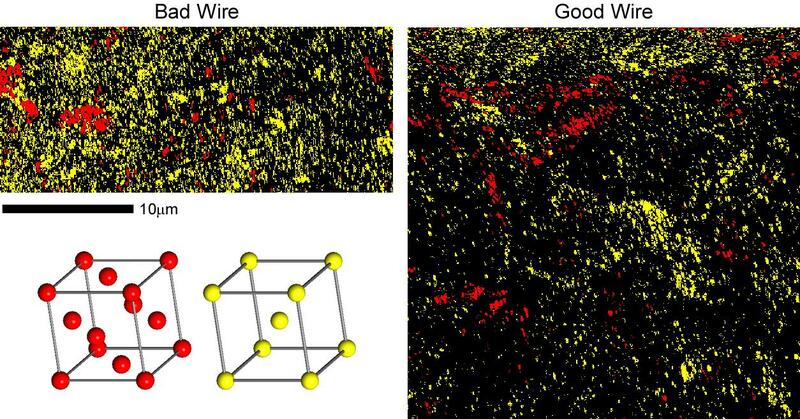 The distribution of all these oriented crystals will affect the properties of the wire such as the tendency of one wire to break more quickly than another and likely the vibrational response when the wire is struck. The texture arises from the thermo-mechanical processing used to form the wire. Another noteworthy feature in these maps is that there seem to be clusters of similarly oriented material in the FCC case. I checked to see if this remains true when considering an IPF map from another direction – in this case parallel to the vertical direction in the maps. It does – the clustering is consistent in both maps. This suggests to me that these are subgrains arising from fragmentation of larger grains during the wire forming process. The following pole figures show the textures of the drawn wire. One interesting thing to note is that the textures are not fully axisymmetric. This may be due to the lack of sampling statistics but may also provide some indication of asymmetry in the wire drawing process or possibly a remnant of the pre-drawing texture in the material. This is more pronounced in the case of the bad wire – particularly in the FCC phase. However, conclusions from such subtleties in textures obtained from so few orientations should be considered with a good deal of skepticism. It should be noted that the measured textures did not have the  crystal directions in the BCC phases exactly aligned with the sample normals. This required a rotation of the data by as much as 6°. However, this is not unexpected. It is unlikely that the wires were mounted with the longitudinal axes of the wires perfectly vertical in the sample mounts. In fact, being off by only 6° shows why I asked Ron to help me with the sample prep. Comparing the IPF maps with the textures, it is surprising that the intensity of the (110) peak in the BCC phase is not as high as the (001) peak in the FCC phase. However, crystal direction maps show the following volume fractions (within 10° of the given [uvw] parallel to the wire longitudinal axis (WLA)) which are more in line with the impressions given from the IPF maps that the bad wire has a strong  texture with about double the strength of the  texture in the good wire and the BCC  fiber textures are considerably stronger than the  and  fiber textures in the FCC phase. While there are some notable differences in the microstructures of the materials, I can’t really offer Keith much help in keeping his wires from breaking. Nevertheless, it was interesting to compare two samples from a materials application that I had not previously thought about. Sadly, I would also point out that knowing more about piano wires has not expanded my repertoire beyond chopsticks!